Potato chips, potato fries or crispy potatoes what would be your pick for a snack? And don't you tell, they are all the same! The internet is currently debating over the differences between these snacks and we are not kidding the extent it has gone to. A guy's tweet explaining how chips are different from fries and how they are not crisps, has got everyone around the globe defending their idea of potato snack items. The US and UK spellings may have little difference, but when it comes to food treatment, it is varied. So a UK guy's version of potato chips is much different from what people in other parts of the world call it. Smoothies and Milkshakes are Not The Same, Know the Difference Between the Beverages. Well, potato in any form is snack-worthy, more so when it is fried. To state the ongoing confusion on the internet right now would still make it complicated. America's french fry is British's potato chip. The furore is now going viral on the internet, thanks to one tweet. This single tweet has incensed users, with each of them defending what they call it in their country. The person who tweeted was himself shocked that this discussion would take such a turn and turn into a viral debate. The basic difference between chips and fries is the way they are made. American fries need not have a definite shape they could be thick, short, long or too skinny. 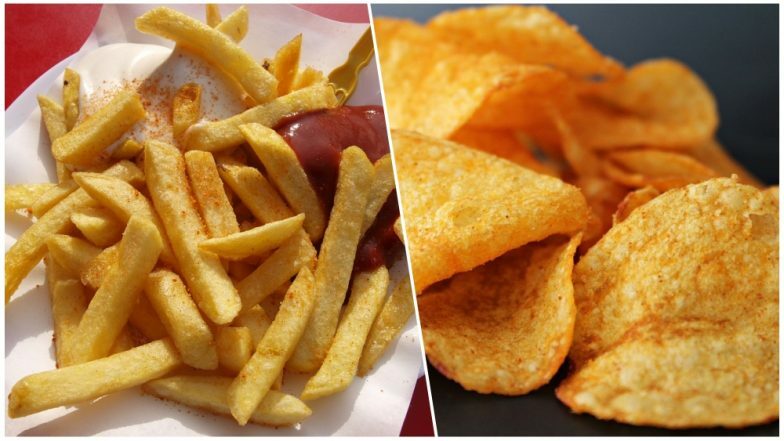 Potato chips are those when the potatoes take a thick form compared to the American fries. The preparation does not exactly differ, other than the size in which the potatoes are cut. The snack became popular as french fries when popular food joints presented the fries/chips along with burgers as sides. Now in India, the same is called as finger chips. McDonald's French Fries to Cure Hair Loss? Chemical Found in Fast Food Can Treat Baldness, Claims New Study. The confusion continues with potato crisps, which we commonly refer to as potato chips. Crisps are as the name suggests, thin and crispy slices of potatoes. There are again a variety of crisps- salted, spicy, sweet etc. The potato crisps could well be called as wafers to avoid all the confusion. Basically, it is all potato fried in different forms guys! Just how we joke about snacks getting fancier names when they are abroad. For Indians, its all french fries and wafers. We hope people just enjoy the snack rather than fussing over the name so much.